(L-R) CEO Nexedge Technology (M) Sdn Bhd Simon Yew, Inno Rack Product Manager Hideaki Okano,CEO of LTdL 2017 Emir Abdul Jalal, Event and Promotions Executive, Subs Spritzer Bhd Shaun Yap and Director of Ciclista Sports Sdn Bhd Mohamed Othman. SHAH ALAM, 17 February 2017 : Le Tour de Langkawi 2017 today rolled on with three more sponsors coming on board to ensure a smoother ride when Asia's biggest cycling event gets underway from February 22 to March 1. Sea Tackle Sdn Bhd, the distributor of Inno Rack will make their debut as sponsors, providing 60 units of roof racks for team cars, the race cavalcade, radio communications and neutral service cars. "Inno Rack is Japan's most popular car rack, with a 60 percent market share in that country, with its own manufacturing facilities in Japan, China and the USA. It comes from a company with a long history, Car Mate, having been founded in 1966 by Takaaki Murata, who is best known for his invention of the car seat headrest. Inno has been in the market since 1976, so it is only just that they make their presence felt in Malaysia," said LTdL 2017 chief executive officer Emir Abdul Jalal. "I can say that car racks are synonymous with cycling and a vital part of team operations in a cycling race. Thus, this is a vital and much needed area of support for the race," he added. Nexedge Technology (M) Sdn Bhd extends its relationship with LTdL, established in 2010 as the provider of radio communications equipment and services throughout the race, worth RM100,000. "This is another strong partner LTdL has developed over the years and we must say the home grown expertise in the field has also been developed through this relationship. In a race of such magnitude, the importance of digital radio communications solutions can never be discounted. This ensures vital information is instantly disbursed throughout the race, ensuring its smooth running," said Emir. With a race entourage of over 1,500 people being mobilised under searing Malaysian heat, hydration is another important area to be secured and this year Spritzer has come on board as Official Natural Mineral Water. In all 4,500 cartons of 600ml mineral water and 500 cartons of Spritzer + Fiber, a healthy beverage that contains soluble dietary fibres for optional intestinal functions with its prebiotics effects. "I can say that Spritzer is quite easily the most popular and trusted mineral water brand in Malaysia. It is a homegrown brand that has come a long way since its founding as a small start-up in Tupai, Taiping in 1989. It has expanded in phases and today have acquired land banks of about 330 acres of natural pristine surroundings amidst natural tropical rainforest to protect the integrity and quality of its products," said Emir. "Spritzer is a brand Malaysians are proud of and we too are proud to welcome then on board Le Tour de Langkawi." 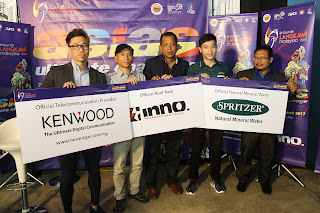 Also present were the representatives of the respected companies, they are Simon Yew (CEO Nexedge Technology (M) Sdn Bhd), Hideaki Okano (Inno Rack Product Manager), Shaun Yap (Event and Promotions Executive, Subs Spritzer Bhd) and Mohamed Othman (Director of Ciclista Sports Sdn Bhd).